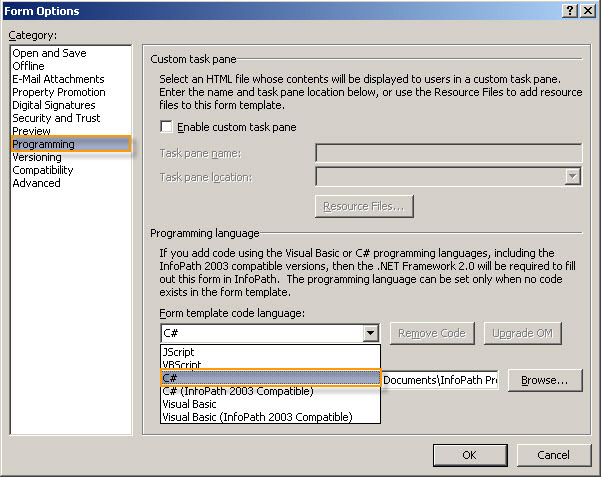 When I was doing customization in InfoPath, I had some difficulties to find the XPath of user controls, after spending several minutes I found a way to determine the XPath in InfoPath 2007. I just wanted to share this in my blog, because there is no any straight forward answer in the web. 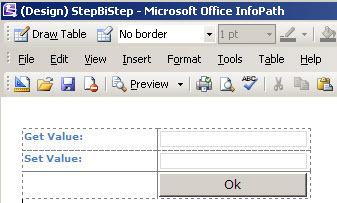 Step 1: Create a blank InfoPath template and add an User Control from the Controls Design Tasks (On your right hand side of the InfoPath). In this example I have added two Text Boxes and a Button and re-named them. 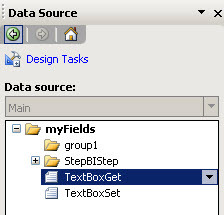 Step 2: Select the user control and click the Data Source in the Design Tasks. Step 3: Now, you can see the selected control’s highlighted name in the Drop Down List. 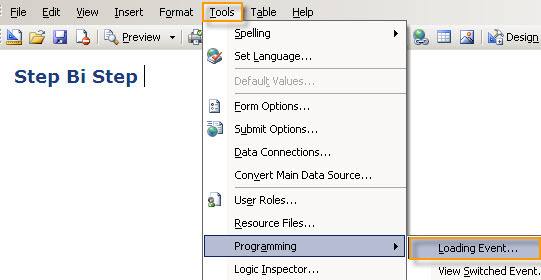 Step 4: Click the Drop Down arrow and select the Copy XPath in the list. Depend on our requirements we can choose the programming language in InfoPath, there are 4 different languages (According to my knowledge C#, VB.Net, JScript and VBScript) in InfoPath and there are some limitation/difficulties in scripting languages (debugging, not supported in browser forms and lack of resources), so we will stick with our familiar C# or VB.Net. 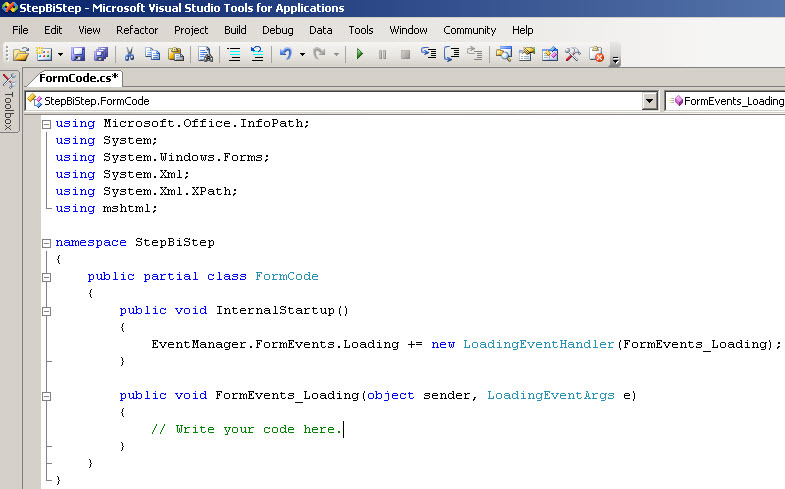 We can use either Visual Studio Tools for Applications (VSTA) or Visual Studio, in this example I used VSTA. 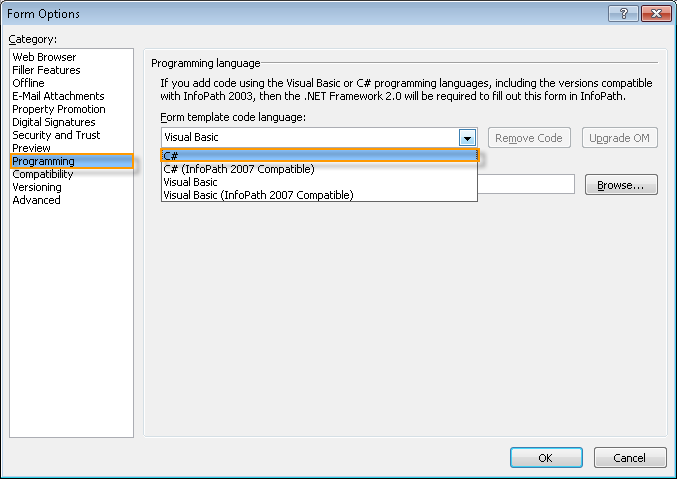 Step 1: Open a InfoPath template which you want to set the programming language. Step 4: We are ready to rock 🙂 If you want to code in the Form loading event, just go to Tools –> Programming –> Loading Events..
You are currently browsing the archives for the VSTA category.